Villa Bellavista C6 with private heated pool, wireless Internet .. 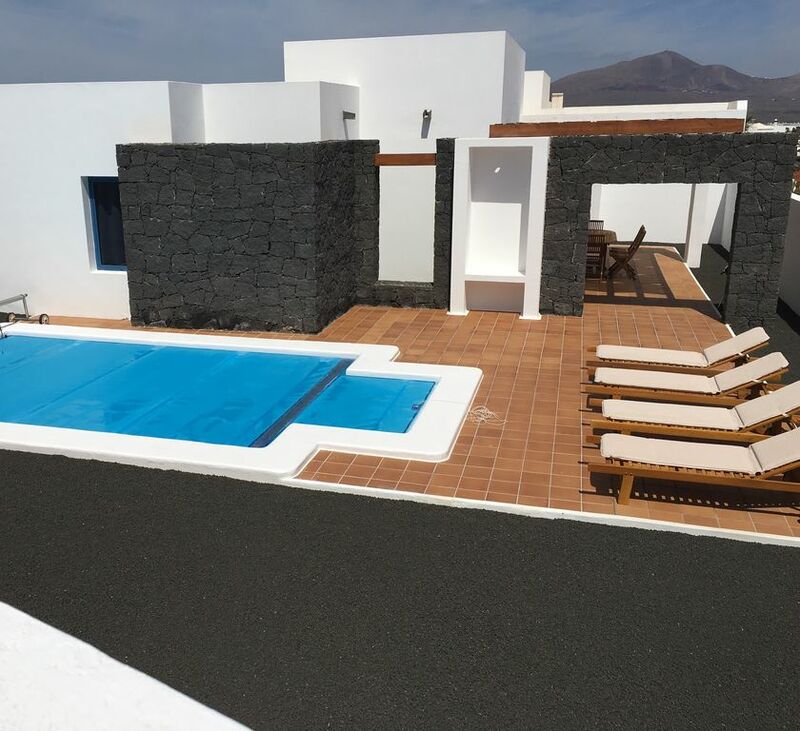 The Bellavista C6 villa is located in the fascinating volcanic landscape of Lanzarote in Playa Blanca just 15 minutes from the beautiful Flamingo beach. Ideal for a holiday with friends or family. The villa Bellavista C6 has a heated pool, which invites all year round to a relaxing bath. The spacious terrace is ideal for a long sun bath or an entertaining afternoon, ideal for a barbecue in the mild climate of Lanzarote. The interior of the room in which predominates a clear modern style, is tastefully decorated. For entertainment there is a 37 "satellite TV, DVD, wireless Internet access and air conditioning. The villa offers a bedroom with double bed and en-suite bathroom and a second bedroom, equipped with two single beds. The fully equipped fulfills the promise of comfort, there can cook comfortably. The villa guarantees a holiday in a well-kept place in one of the sunniest places of Lanzarote. * The time of entry into the villa is from 3 pm and check out time on the last day is 10:00 am. As long as the availability of the villa allows these schedules can be modified, ask in advance. * Prices are for 2 people. For each additional person would have to pay 10 euros per night and per person. A cot and highchair are available at no extra cost, please ask in advance. * The house has a safe. (It has a size to fit a laptop). * The pool is heated by heat pump. Bed linen and towels are changed on bookings of 8 nights or more, for 7 nights or less, no; and the price includes final cleaning. * Wi-Fi is included in the price. Hairdryer on request. The Bellavista villas are located in Playa Blanca, the sunniest and most southern of Lanzarote which boasts many beaches with fine golden sand and calm waters and a beautiful promenade that stretches from "Lighthouse Pechiguera" to "Puerto Marina rubicon "aligned with a variety of cafes and wonderful restaurants to suit all tastes. There is also a craft market held in the "Marina Rubicon", on Wednesdays and Saturdays. You can buy the usual range of leather goods, clothing and souvenirs. The port is surrounded by a selection of luxury shops and fine restaurants. Peaceful golden sandy beaches are provided by Playa Flamingo and Playa Dorada and popular beaches, the beaches of Papagayo, where you can enjoy the sun, water sports or just take a walk. The beaches of Papagayo are located in a nature conservation area. These are pristine beaches and undeveloped with impressive caves, turquoise waters and fine golden sand. * La hora de entrada en la villa es a las 15:00 de la tarde, y la hora de salida es a las 10:00 de la mañana. Siempre y cuando la disponibilidad de la vivienda lo permita se podrá variar las horas de entrada y salida. Consultar. * Los precios arriba mencionados son para hasta 2 personas. Por cada persona extra habría que pagar 10 euros más por noche y por persona. * Una cuna y una trona están a disposición del cliente sin coste extra, por favor consultar con antelación. * La casa dispone de caja fuerte. (Tiene un tamaño como para guardar un portátil) * Piscina climatizada con bomba de calor. Las sábanas y toallas ( incluye toallas de piscina) se cambiarán semanalmente y el precio incluye la limpieza final. * La conexión wifi está incluida en el precio.